If you’ve ever seen a photograph of an astronaut prepared to leave the surface of the earth and head into space, you’re familiar with what spacesuits past and present look like. What most of us haven’t been able to see is all of the components and electronics that go inside of the spacesuits to make them work and allow the astronauts to survive in space. A new exhibit is opening at the Smithsonian National Air and Space Museum that shows what the spacesuits look like on the inside. The exhibit is called Suited for Space and has various x-ray images and photographs that show intricate components inside spacesuits. The photograph you see here is an example of one included in the exhibit showing what an over boot used to explore the surface of the moon and a space helmet from the Apollo era look like on the inside. 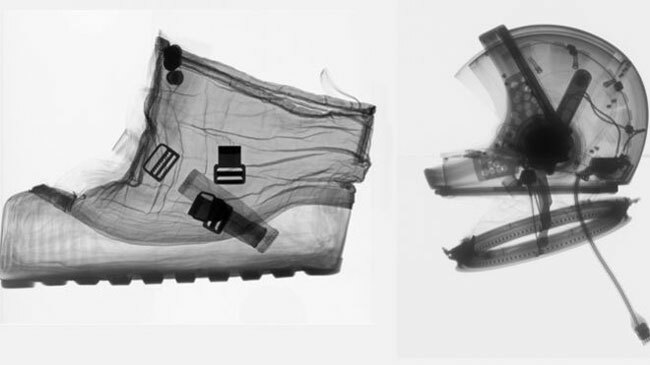 These x-ray images were actually created to help conserve and research the nations spacesuits. Some of the spacesuits are now around 50 years old and are starting to degrade. The exhibition will trace the evolution of spacesuits from the high altitude test flight suits of the 1930s to the space age with the Mercury, Gemini, and Apollo as well as space shuttle missions.